Block Mates build upon the wonderful foundation of unit blocks by providing children with a themed exploration set, designed to enhance the original principles of block-building. All Block Mates aredesigned to fit standard unit blocks and can be built in their natural form or mixed and matched with others in the set to create new, imaginative vehicles or creatures. Our patented gasket design ensures a snug fit. Blocks not included. Ages 3+. 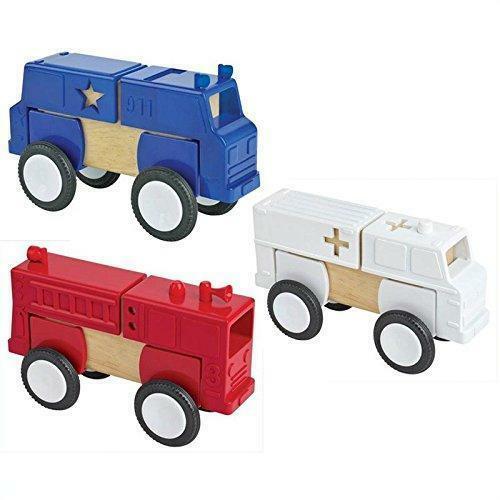 Set of 4 community vehicles: Fire Engine, School Bus, Ambulance and Police Car. Features rugged wheels with steel axles.